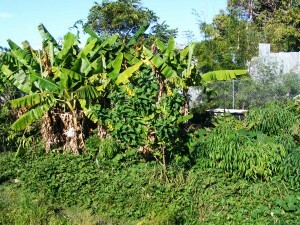 The Coffs Regional community garden has one of the very best collections of subtropical and warm temperate edible and useful plants to be found anywhere in NSW. Showcasing a vast range of fruits, vegies, herbs, nuts, grains, spices, exotic and native plants, the CRCG is now a literal botanical garden of diverse permaculture-inspired food production. 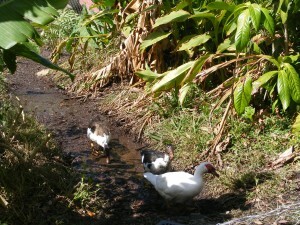 The CRCG management is also fully committed to organic production methods which include producing quality compost and liquid fertilizers, employing natural pest and disease control methods, promoting beneficial organisms and utilizing productive animals (Chickens, Muscovy ducks, Rabbits and guinea pigs) for foraging and additional nutrient recycling. The overall effect is an amazingly diverse, living demonstration of optimal and year-round abundant organic production. If you haven’t yet visited the CRCG or haven’t been to see it lately, you’ll be very impressed with all the growth! 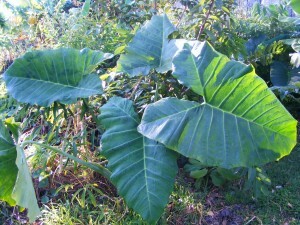 Plants create a major part of the foundational diversity from which garden eco-systems are based. In the majority of natural systems there is a dynamic range of species that fill each niche and together combine to give stability and resilience to the system. Permaculture as a design science makes great use of these models provided by nature and sets about creating abundance through maximum integrated diversity. In most landscapes there are a range of potential ‘micro-climates’. These are significant variations of conditions including ambient temperature; soil type; soil moisture content; drainage, aspect to the sun and topography. These differences within a particular area influence how particular plant species will grow. With research and practical experimentation, the optimal microclimatic conditions for each species can be understood and utilized to ensure optimal health and production. In Coffs Harbour we enjoy a idealic climate that is situated perfectly between the Sub-tropical latitudes and the Warm temperate zones. The mountainous landscape of the Great Dividing Range coming right to the coast at Coffs Harbour, further enhances the micro-climate extremes giving rise to an optimal potential to incorporate the largest range of edible and useful plants from around the Earth. At the South eastern corner of the garden we have our very best north-facing and protected aspect. The slope here is even greater than our main subtropical area and we have some extra deposits of soil at the highest point (giving perfect drainage) and continuing down the slope towards the creek we have our Muscovy duck pen in the middle. 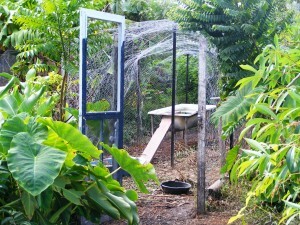 A swail has also been created below the duck pen to capture the run-off nutrient and make further use of a permanent damp location (possibly a permanent spring or leaking water pipe) we have situated other plants that enjoy higher than average amounts of water such as Sugar cane, arrowroot and Taro. In this top corner of the garden on the extra mounds of top soil we are successfully growing papaya, Abika, avocado, sour sop, Amberella, Sea grape, Custard apples, Rollinia and again utilize perennial vegies as the understory until these trees form a canopy in a few years time. Outside the enclosed fenced area on the northern edge of the CRCG we border a natural creek tributary that eventually flows into Coffs Creek. This part of the garden gets substantial shade and cool conditions particularly during winter where the creek vegetation creates a major shade zone. This area represents our best warm temperate area, being naturally cooler and with less direct sun exposure. In this warm temperate food forest we are successfully growing the whole range of Citrus, Low chill or ‘tropical’ varieties of apples, pears, peach, nectarine and plums. We also have in this area exotic figs, mulberries, Chinese raisin tree, Black walnut, pecan nut, Kiwi fruit, pomegranate, Olives, Maple syrup tree, Kei apple and some bush tucker plants including macadamia, Rose apple, peanut tree, Atherton almond plum pine. Within our annual vegie and herb production range, we have been acquiring heirloom and long term locally adapted varieties where possible. We now have a seed saving program and our own seed bank that supplies most of the seeds we need for our nursery seedling production and for maintaining the interplantings throughout the garden. The Coffs Regional community garden is evolving into ever increasing diversity, and demonstrates a reliable and perennial approach to garden food production. By cultivating the maximum diversity of productive perennial species, then interplanting with self seeding and self perpetuating annuals and devisable varieties, we have successfully created food forests that are resilient in all conditions, diversely productive throughout the year, very low in incidences of pest and diseases and would survive and continue to flourish even if no more human attention were given to them. Now that’s sustainable abundance by design!! To grow fresh organic fruits, vegetables, herbs, spices, grains and nuts for the consumption of those participating in the community garden. To create opportunities for social interactions and to enhance the resilience of Coffs Harbour’s communities. To promote optimal regional biodiversity. 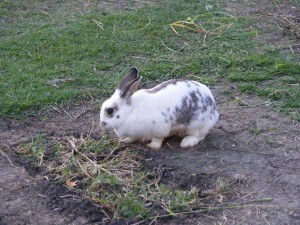 To foster community education, life-skills learning activities and self reliance. To adopt appropriate principles of sustainability, conservation and bioregionalism in our gardening practices. The financial year of CRCG begins from June 30th. The period of rental of a private garden plot is for the financial year, joining beyond the midterm months (December to May) will incur a half price fee. The Committee of CRCG shall decide at its discretion the registered members who will be invited to apply for annual rental garden plot. The Users acknowledges that Voluntary Workers Personal Accident Insurance is for genuine Accidents Only. 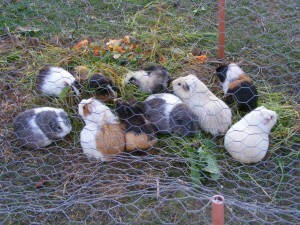 That biodiversity and companion planting will be promoted in their garden plot. 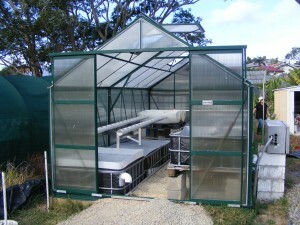 To utilize heirloom, non-hybrid and native Australian plant varieties. (Genetically modified seeds or plants are strictly denied) . 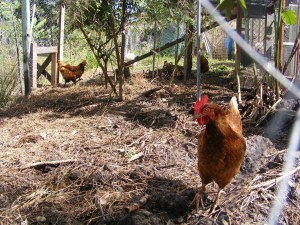 To create and use organic composts, mulches and fertilizers. 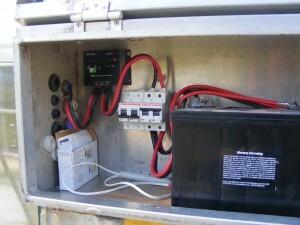 To monitor for and learn about organic pest and disease control measures and techniques. 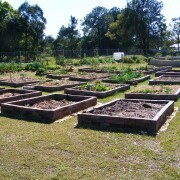 The USER acknowledges the security limitations of the community garden and accepts that produce from the allocated private garden plot may be misappropriated (particularly if mature perishable fruits are not harvested in a timely fashion). The USER accepts such misappropriation will not be reimbursed by CRCG. The USER agrees that produce harvested from allocated private garden plots is for their consumption or may be given away or exchanged. 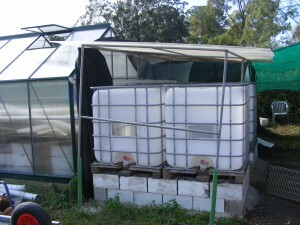 The USER fails to properly maintain their allocated private garden plot including and particularly:- The removal of weeds (couch and nut grass in particular) and any mature fruits such as tomatoes or other crops susceptible to pests and diseases are harvested in a timely fashion and spoilt produce removed and disposed of appropriately (bagged and taken off site; seeds extracted for later use and the rest composted or directly added to the liquid fertilizer). 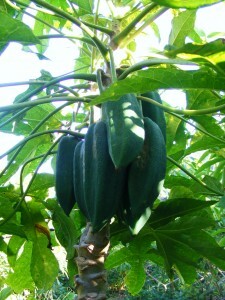 If no produce is planted for a period of 8 weeks where it would have been possible for another member to use the private garden plot for production purposes. The USER contravenes any of the Conditions of this Agreement. The USER agrees that their right to use the allocated private garden plot cannot be transferred to another CRCG member of any other third party without the prior consent of the garden management committee. 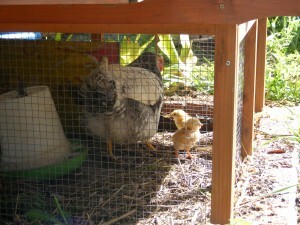 The law of the State of New South Wales shall apply to the interpretation of this Agreement.